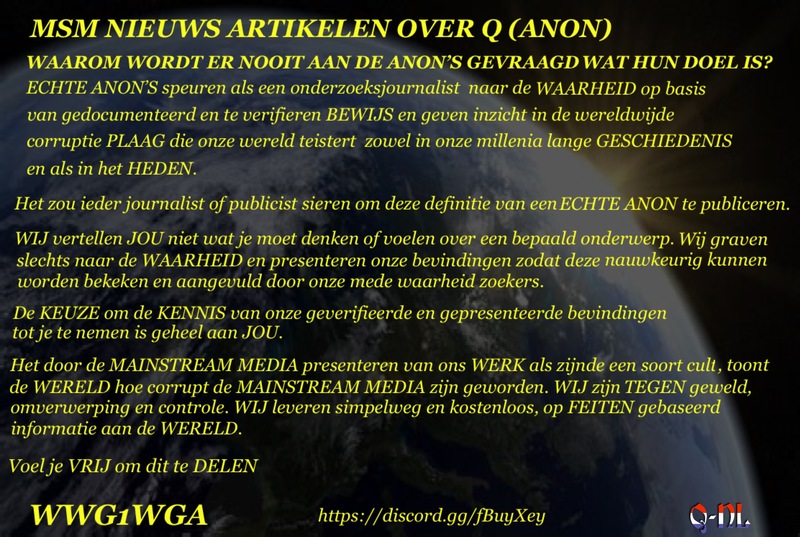 Sinds de maand November 2016 volgen we op gedachtenvoer en dotcom.radio het fenomeen Q anon met ons team. De anonieme volgers van de door Q “gecodeerde “kruimels” die zicht moeten verschaffen in het donkere verleden van de “Deep State’, en ons daarmee een sleutel geven naar onze eigen toekomst. De leugens doorprikken van overheden en media over de gehele wereld. Die media verkeren nu in een absolute DOODSSTRIJD en hebben hun ALLERLAATSTE middel ingezet. De nog slapende bevolking proberen te overtuigen dat de Q anon stroming een samenzwering is vanuit de donkere spelonken van het Internet. Sinds de maand April van 2018 publiceren we hier ook elke maand de bevindingen van Mike Donkers vanaf zijn Factsforum in het Engels [vertaal met google translate naar het Nederlands al dat handiger is voor je] De meeste Q drops zijn in het Engels en alles vertalen is onbegonnen werk. – He was held at Gitmo and sentenced by a military court to death by fire squad. – He was allowed to take his own life. This is called the “Rommel option” (Hitler allowed Erwin Rommel to commit suicide with his reputation intact as well). I have a feeling we haven’t heard the last of No Name’s treasonous acts yet. Isn’t it interesting to see the liberal media calling him a sexist/racist/homophobe years earlier and now lauding him as a “war hero” and lambasting Trump for being so lukewarm about his death? Expect a false flag gas attack in Syria, in the only area still controlled by the Deep State: the province of Idlib. With the information about to come out they will need a distraction and since ISIS, Al Qaeda front groups and the White Helmets are still active in Idlib it makes the most sense that they’ll attempt to pull off another fake chemical attack there. The Russians have already warned about an upcoming attack and are moving their warships in place. Should the attack happen, Trump will blame Assad again and order strategic missile strikes once again. Together with the Russians, they will finish off these sponsored jihadists once and for all. It looks like Iran is getting cleansed of Deep State agents as well. President Rouhani tried to blame the U.S. for the poor state of the economy following American sanctions, but he failed miserably. Meanwhile, several spies with “dual nationalities” (would that include Israeli citizenship as well?) are now being rounded up. 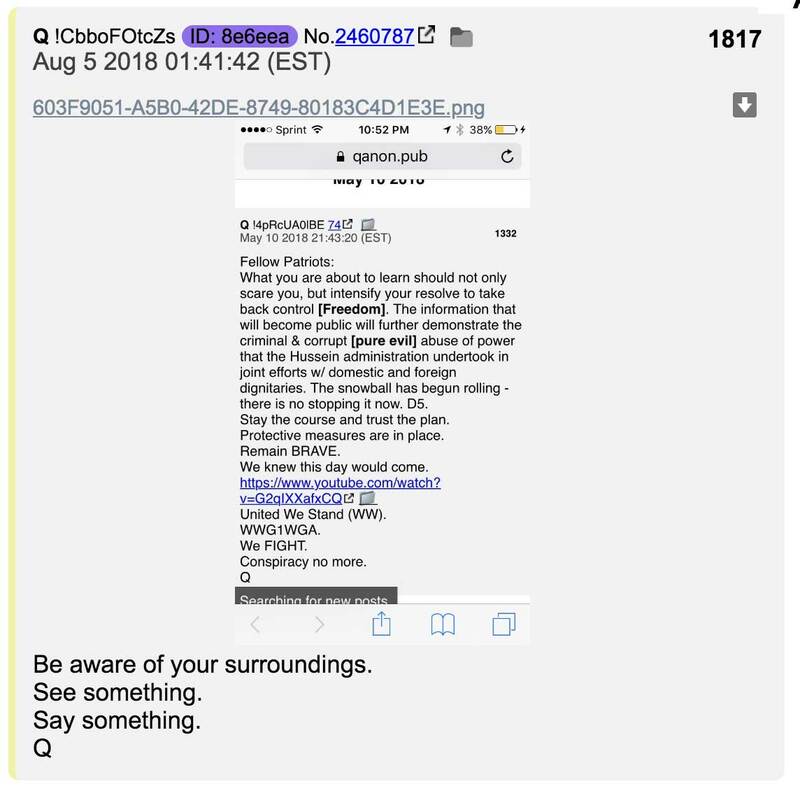 Q tells us to watch Iran. It looks like we’re seeing a repeat of North Korea and Trump can expect a reconciliatory call soon. The Pope is under fire and there are now even calls within the Vatican for him to resign. More and more news stories are coming out of widespread sexual abuse of children by Catholic clergy and now the “liberal Pope” has a huge PR problem. Stating it’s all about “love” ain’t gonna cut it, Francis! Of course the current narrative is that gossip “journalist” Michael Wolfe made the accusation about Blair and that Blair is vehemently denying this, but at least the word about UK spying is now out. So everybody believed that weasle Michael Wolfe when he released his book and the “news” was that Trump drinks Diet Coke, eats hamburgers and is basically a low-IQ individual, but now he’s telling lies? Interesting narrative shift indeed. Meanwhile, Trump is addressing the issue of censorship by Google, Facebook, Twitter and other popular internet platforms. Seems to me an Internet Bill of Rights is in the pipeline. It’s a good idea to keep track of Trump’s tweets, as they are a predictor of things to come. Hillary’s Pay to Play scheme with China will also become a focal point soon, where she allowed China full access to her private server, thus illegally selling state secrets to a foreign power. These world leaders are all traitors and it won’t be long before they won’t be able to show themselves in public anymore! 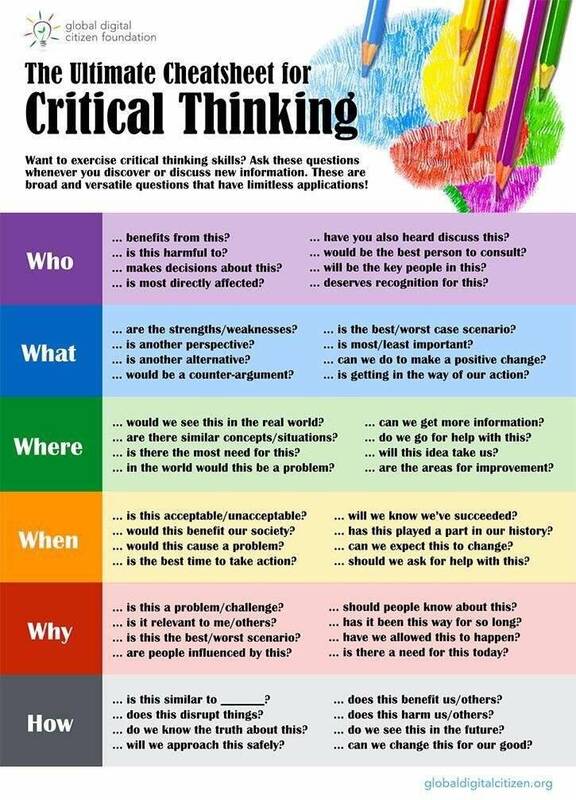 26-08-2018 Als dit plan klopt worden de democraten in de VS op het verkeerde been gezet en de Media daarmee op dit moment al totaal de weg kwijt. De onderstaande redenering is voor gevorderden, uitleg hoor je in de uitzending van 26-08 van dotcom.radio. 22-08-2018 We now have a timeline for upcoming events before and after the midterms. Q talks about 3 “movies”. #1 is around the corner, coming soon to a theater near you, and since Q told us FISA is the start we can expect the declassified FISA warrant very, very soon. #2 is in the fall, which means either September or an “October surprise”. The way I read this is we’ll find out the truth about Benghazi, Haiti, Uranium 1 and other scandals linked to the Clintons and Obama. #3 is TBA, which I think is after the midterms and will reveal the pedophilia, satanic and ritual abuse and other inconvenient truths. Around Christmas time people will be livid and demand justice. 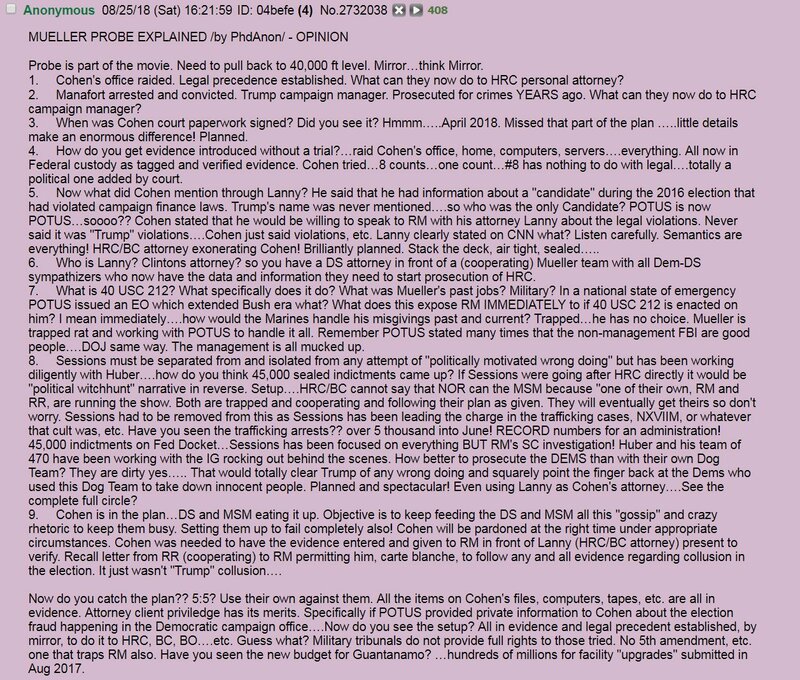 According to an EO signed by Trump, court martials (military tribunals) will take effect starting on Jan. 1st,. 2019. As Q writes: ENJOY THE SHOW! 18-08-2018 Dit bericht komt van het factsforum. Het wordt dan ook tijd om een ieder hiervan in kennis te stellen. Het is een horror verhaal, …. 16-08-2018 Remember Pizzagate back in the fall of 2016? This erupted after the release of the Podesta emails by WikiLeaks, in which code language for pedophilia was used, often referring to food items but not in the proper context: pizza, pasta, cheese, walnut sauce, chicken. The name of a pizza place also popped up: Comet Ping Pong. The owner, James Alefantis (French for ‘I love children’), had all sorts of weird pedo-themed pics up on Instagram and was a known Clinton donor, plus the “artwork” on the walls of the pizza place was pedo-based and satanic, as well as some of the “events” held there. But then the panicky powers-that-be pulled off a false-flag event by having some idiot shoot up the place. The media then put a fork in the whole story by stating that this is what you get when you allow yourself to get carried away with all those conspiracy theories. Alex Jones even went as far as reading a letter sent tio him by Alefantis’ lawyers and apologizing on air to Alefantis. Yet Pizzagate never really went away, the story never died and lesser known alternative researchers continued digging, among whom Liz Crokin. The last few weeks we have seen anons digging up old tweets and pics by Hollywood notables, which has even led to James Gunn, director of Guardians of the Galaxy, being fired. The latest of these sickos to be exposed is Rainn Wilson, who played Dwight in The Office (American version), whose old tweets mention eating babies and sodomizing teens with their cell phones, among other things. And how about loudmouth “comedian” Bill Maher, whose company is called Kid Love Productions? NBC, which has a culture of intimidating behavior toward women, is also targeted and they have now alerted their staff to an app to delete old tweets. Which explains why 200 U.S. newspapers are now in full attack mode against Trump for calling the MSM the enemy of the people (which they are). Trump’s tweets are in overdrive, too, and he’s gearing up the masses for the treason and corruption committed by Deep State actors in politics, the media, Hollywood and the music industry. Major revelations on the horizon, Dan, brace yourself! 12-08-2018 We are counting down to the full declass of the FISA warrant, as well as the IG Report. Personally, I think the FISA warrant will be disclosed in the coming week. The interesting thing about the FISA warrant is that it ties multiple parties together, including the UK government as well as the MSM, who are complicit in this betrayal of the American people. The truth is about to drop and these people literally don’t know what to do! The media have now launched an all-out attack on Devin Nunes, all of which is to no avail since a growing number of people no longer mainstream news media. – AJ’s attempts to “debunk” QAnom have failed miserably and have only hurt him, as more and more people (including myself) who once followed Infowars no longer consider this a reliable or noteworthy source of information. By being banned, AJ has successfully drawn attention to his website and other eisting media outlets. – Following the banning of Infowars, alt media devotees have succesfully been distracted away from QAnon, while AJ performs his duties as a gatekeeper of information, such as continuously stating that China has infiltrated U.S.government circles, while failing to mention very powerful zionist influences (even though jews only make up 2% of the American population). 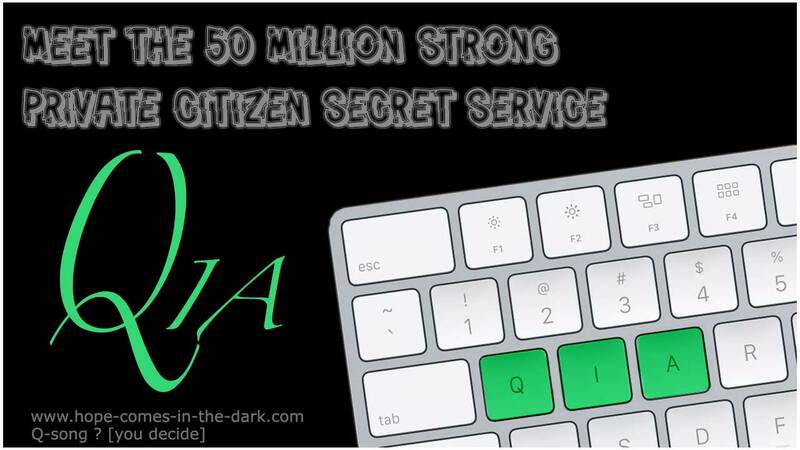 Meanwhile, some very vocal individuals associated with Infowars are using ridicule, false logic and other dishonest techniques to try and discredit QAnon, among whom Jack Posobiec and Lee Stranahan. In the MSM, liberal comedian Bill Maher is now taking shots at QAnon. And all of this for a LARP? And guess what they’re putting out about the person who was arrested for starting one or more of the California forest fires? He was a Q follower, just like that guy who blocked traffic to a bridge some time ago! The message is clear: Q is dangerous and so are Q followers. 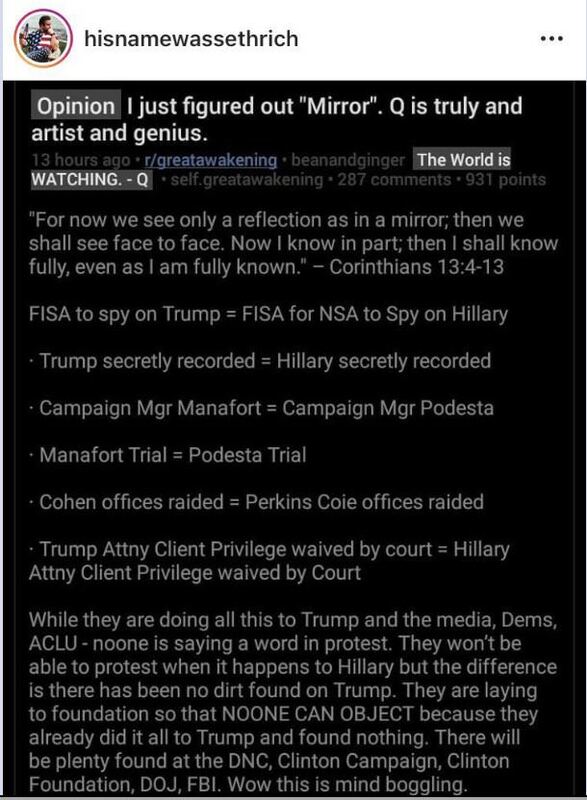 There’s a very real chance they may try to pull off something some sinister to pin on Q, so we need to be vigilant! But there’s more. 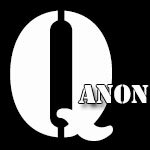 The Q archive website qanon.pub was down for a brief period of time but is now back up and forwards to qanon.app. 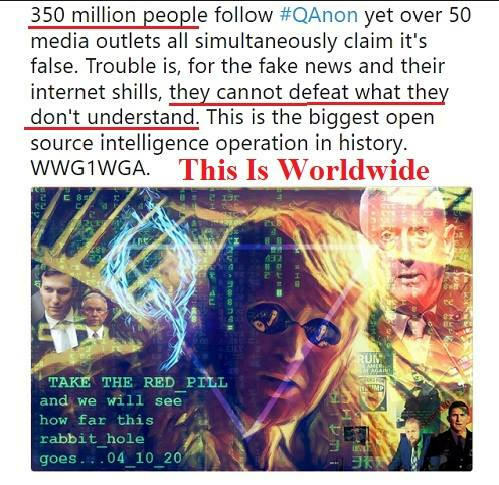 Q’s trip codes were also hacked and what diehard anons called a “concernfag” then posted a message to the newcomers, basically stating that the country is in dire enough straits as it is, without that “dangerous” (here comes that word again) Q phenomenon misleading well-meaning patriots. Were not falling for it. Again, all of this for a LARP? It gets better, though. This dude published Q’s tripcodes and looking at them it’s a miracle the hack hadn’t happened sooner, that’s how easy to guess the passwords were! Q then changed his trip and wrote “fishing is fun’. In other words, they fell right into a trap set up for them and now their identity and location are known! Then there’s the Assange connection. I’m sure you’re now aware of the fact that not only has Assange been requested to leave the Ecuadorian embassy in London, but the American Senate has also requested him to testify before Congress. Once again, will we see Assange actually leaving the embassy very soon or will it just be an item in the news? If we don’t see footage of Assange there’s a very real chance he’s already in the U.S. and that this news item is just optics to justify Assange’s presence in the U.S. It’s also a perfect way for Assange to escape arrest in the UK and hopefully be pardoned by Trump. And once again Q writes ‘we have the source’. Is he referring to Assange? If so, they already have him and he was extracted from the embassy weeks or even months ago! You’d better brace yourself, because within the next few weeks a BOMBSHELL will drop, which amounts to nothing less than a British ACT OF WAR against the U.S.! It’s all in the classified 20 pages of the FISA warrant. And believe you me, they WILL be declassified by Trump. Its shocking contents will unveil the treacherous role the UK played in the undermining of the 2016 American election and will spell the definitive end of May’s rule. Needless to say, the Deep State is in a serious state of panic! Their Hail Mary strategy is now to do what they already tried during the 2016 campaign: send thugs dressed as Trump supporters to his rallies to stir up violence and even attempt to assassinate Trump. We know of at least one such attempt, which has been thwarted. Q tells us they knew this day would come. They also knew their movement would go mainstream worldwide. Not only that, this was planned and necessary to launch their next move: full disclosure of the FISA warrant. Yet, despite all that, luckily you still need to produce EVIDENCE to impeach anyone, which they don’t have, much to their detriment. Here’s how I read this: less than 10 people are in the loop, among whom POTUS. Unless they ask Trump, chances are many people close to Trump honestly don’t have anything sensible to say about QAnon. Sounds very plausible to me. If both Manafort and RR are really on Trump’s side and RR is now trying to convict Manafort for the same offense he defended Manafort against 10 years earlier, Manafort will walk because of Double Jeopardy (you can’t be convicted for the same crime twice, whether you were found guilty or not), plus Manafort can call RR to the witness stand as part of his defense, thus legally introducing highly damaging testimony to the Deep State in a court of law. Rosenstein will then have to step down, the Russian collusion delusion will definitely be over and POTUS will have the freedom to replace RR with one temporary hardass after another without congressional approval. 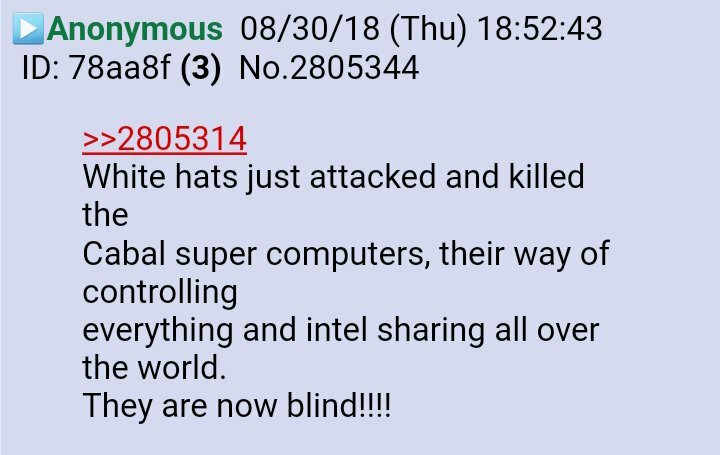 These white hats are a very clever bunch indeed!